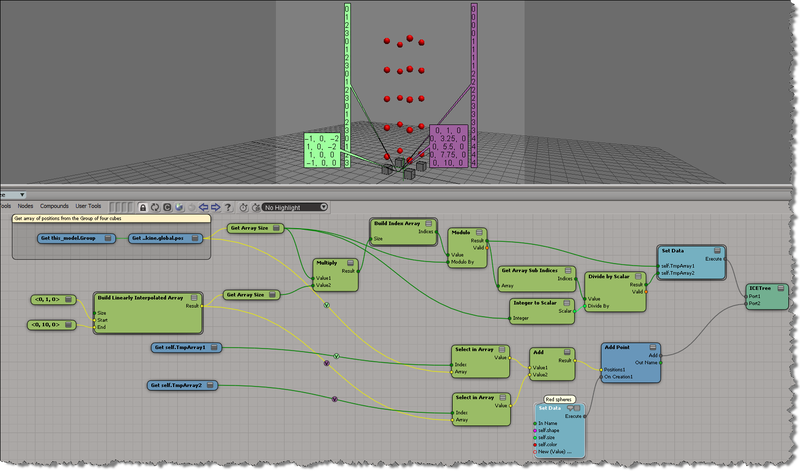 This entry was posted in ICE and tagged arrays, ICE, loops, repeat, Softimage by xsisupport. Bookmark the permalink. Thanks for the tutorial. 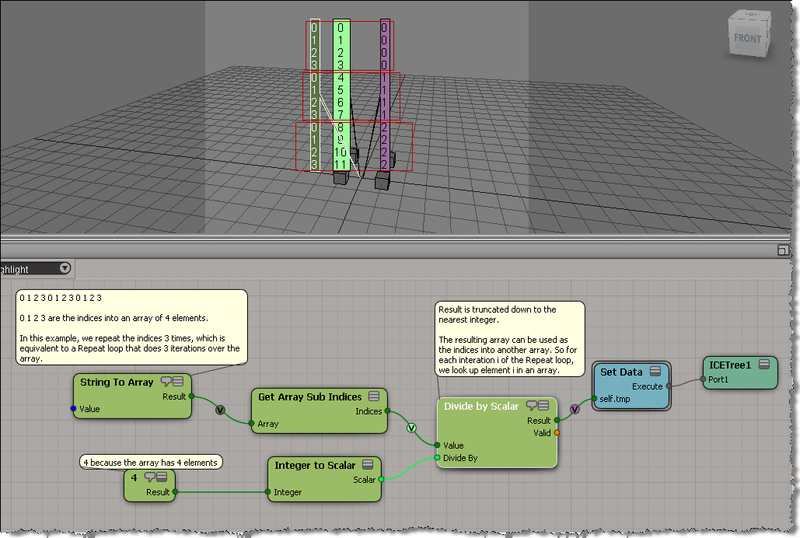 I tried to use this way to loop for my own purposes, trying to avoid the repeat node. But I failed to find a way to alter a variable which needs to change every iteration. While the counter in the repeat node gets increased every time the repeat gets executed, I pass a value to a global variable. THe next time my loop gets calculated all calculations depend on this variable. Is there a way to use your approach with my needs? So far it seems that this kind of loop needs a “fixed” execution, in which no variables can change. You would build another array that contains the pre-calculated values of your global variable. So, it depends on whether you can figure out a pattern for your global variable. What would your loop look like in scripting? That’s the point. It can’t be pre-calculated. I use this loop to “grow” strands on a surface. I move the strand/point position “forward” (last position + movement vector), find the closest location on the mesh (as the position by itself might be inside or above the mesh) and then store this position inside a temporary strandPosition array AND use it as the starting position for the next forward movement. So the next iteration of the loop depends on the last result of its predecessor. It’s a dynamic process. Values can’t be stored in advance. So I wonder whether I NEED to go with repeat or if there is a faster and/or more elegant way to do this.